It's not as easy to find plus sized pants from Liz Claiborne as it used to be. In 2010, JCPenney (JCP) and QVC became the only places to buy Liz Claiborne plus size pants. Following the exclusive deal, JCP acquired the brand in 2011. Fortunately for women searching for their favorite fashionable pants, JCP has selections both in stores and online, and QVC items are available to customers via their website or when featured on their television shopping network. JCPenney shoppers will find two pant options from Liz Claiborne. Styles have a basic appeal that's perfect for wearing to work and then out for dinner afterward. Sometimes pants have matching jackets available, so keep an eye out for that option when shopping. Returns can be shipped or brought to a store location, which makes it easy if you order the wrong size. Who Makes Golf Clothing for Plus Size Women? The black trouser-leg pants come in plus and plus short sizes 14W through 24W, and prices start around $48. The pants are made from a ponte knit and have slash pockets in the front with buttoned welt pockets in the back. The Secretly Slender pants are fitted, washable pants meant to provide a slimming look and feel. They come in sizes 14W through 24W in both plus and plus short; extended plus sizes range from 26W to 30W. These pants are available in charcoal heather and black, and prices start at $56. Good fit in the waist, loose legs, and comfort were among the positive comments from JCP customers, while sizes being too large or small, legs being too big, and length were the major customer complaints. Blogger Monica Wants It All notes that the pants are "forgiving" in her review. The pants are also straight-legged, and they come in both plus and plus short sizes with the same slimming effect. They feature black and white stripes and cost $50. Home shopping network giant QVC offers several plus size pants in the Liz Claiborne New York line. All the options come in regular women's sizes and plus sizes 1X (18W-20W), 2X (22W-24W), and 3X (26W-28W). Each pant page also includes a brief video that describes its features from the television sales pitch, which makes it easy to decide which pant is right for you. 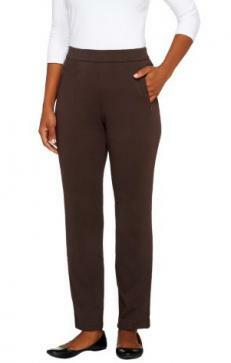 The knit pants have front welt pockets and can be pulled on - no zipping necessary. They cost around $48 and come in bark, black, charcoal heather, and rumba red color options. Feedback from customers was mostly positive. Andiqvc said, "The fit is also perfect. They are not too full cut, nor are they tight." However, another customer noted rise issues, and someone else mentioned the pocket welts can feel like a seam even though the fit was good. The knit boot cut pants have usable front pockets, no back pockets, and seam stitching dyed to match the pant colors. Colors include deep blue, charcoal heather, chocolate, and black, and they cost less than $40. Customers were pleased with these pants, noting the lack of pilling after washing and their loose, comfortable fit. Several noted they did not seem appropriate for their work environments and would wear them for yoga or lounging in. Although the brand's offerings are limited, plus size women can still find dress pants and casual pants from Liz Claiborne. Check out customer reviews when you can, and be sure to read sizing information before making a purchase online.